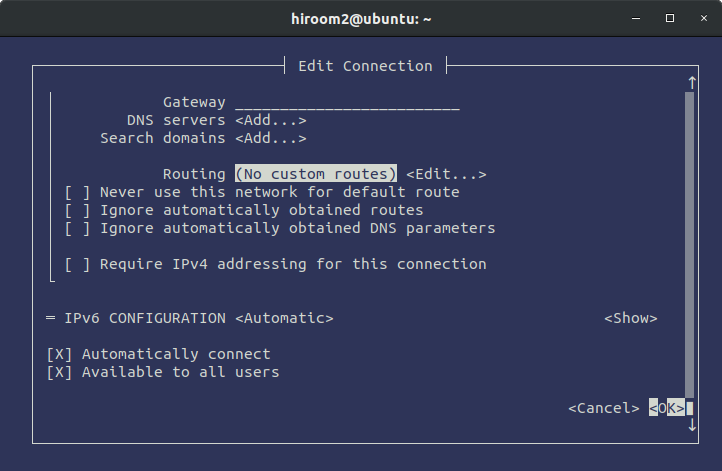 This articlw will describe network configuration like IP address and DNS server on Ubuntu. 2.1. Static network configuration with "Settings"
3.1. 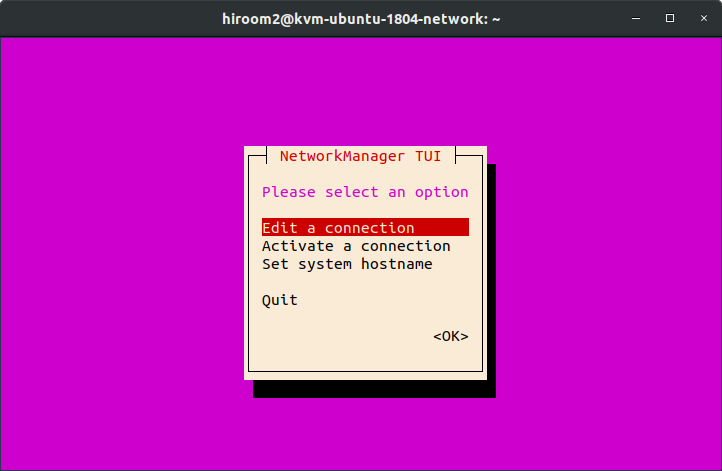 Network configuration for DHCP with "Settings"
NetworkManager sets network configuration for DHCP when installing Ubuntu. 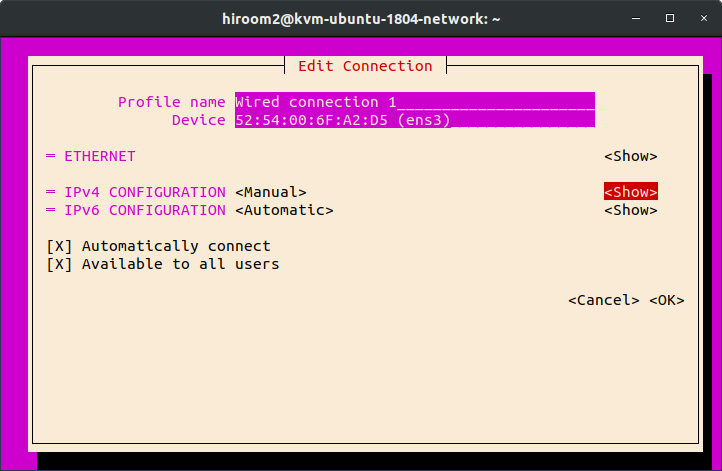 Ubuntu provides /etc/network/interfaces which can run without NetworkManager. 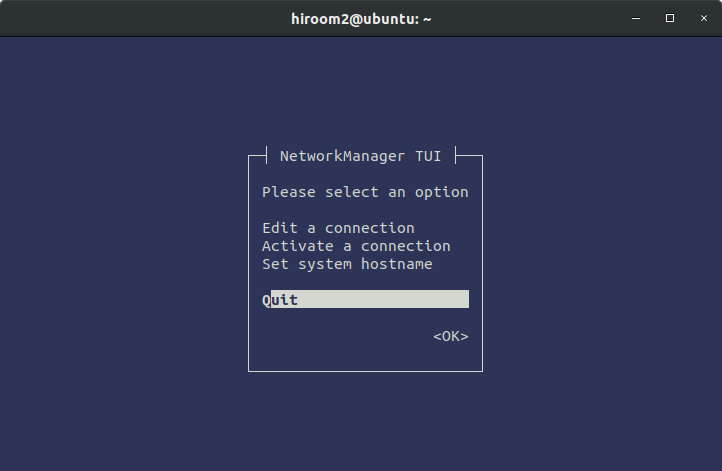 And Ubuntu provides NetworkManager and systemd-resolved. Ubuntu provides systemd-networkd which will be alternative of NetworkManager too. But systemd-networkd.service is disabled by default. 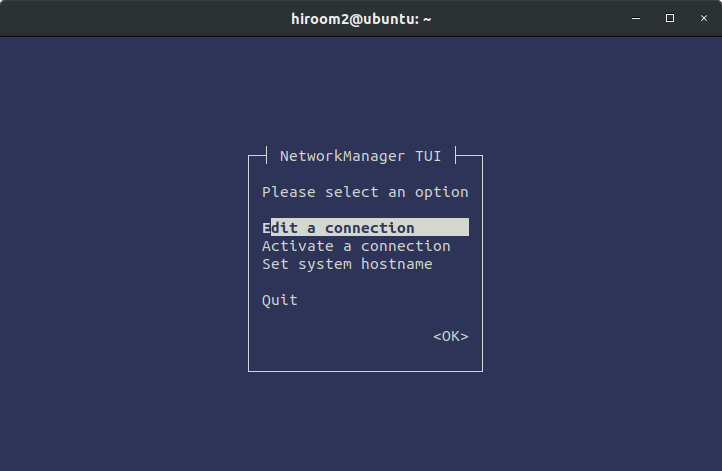 So NetworkManager will be used for a while and you can use nmcli nmtui for a while. 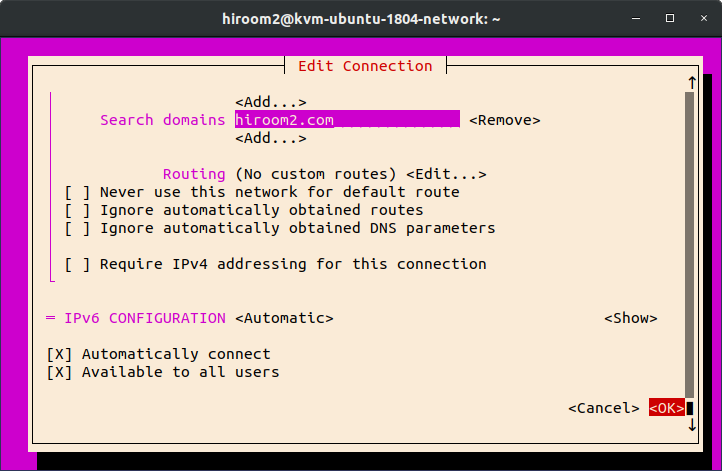 You need to know about systemd-resolved which is provided when Ubuntu 16.10.
systemd-resolved appends nameserver 127.0.0.53 to /etc/resolv.conf, listen 127.0.0.53 and send query to DNS server. You can check DNS server used by systemd-resolved with "systemd-resolve –status". 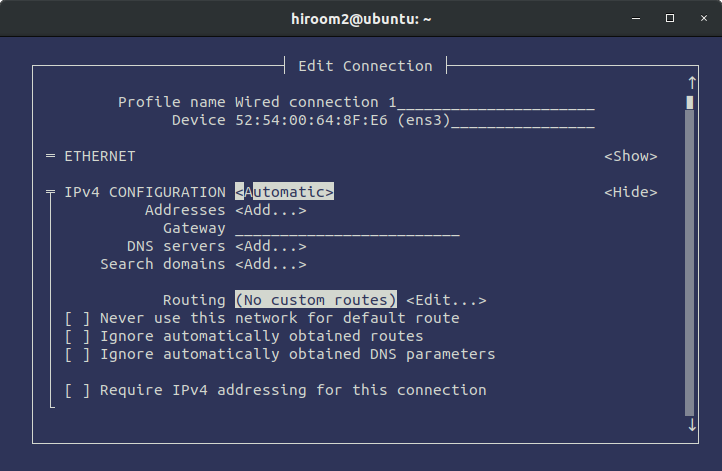 systemd-resolved will send query to DNS servers like round robin. If you use primary DNS server and secondary DNS server for redundancy, there is no problem. This is better for load distribution. If you use primary DNS server and secondary DNS server for different name resolution, you need to change primary DNS server to send query reqursive to secondary DNS server. And you need to make only primary DNS server to be written to /etc/resolv.conf. If you manage DHCP server and primary DNS server, you can change on server side. This article will introduce about static network configuration like static IP address. 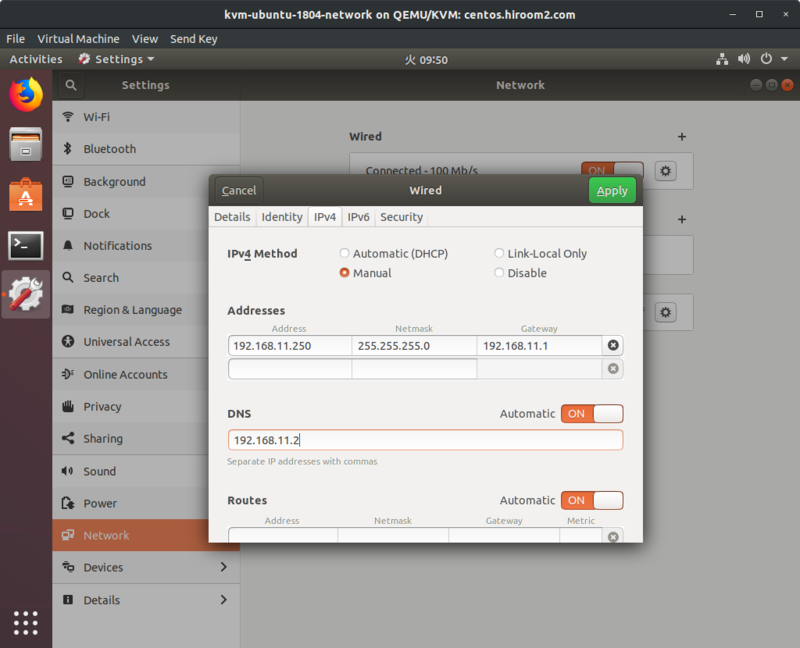 2.1 Static network configuration with "Settings"
Open "Settings" and edit "Wired" of "Network". Change "IPv4 Method" to "Manual". Set "Address" to host machine's IP address, "Netmask" to your subnet like 255.255.255.0, "Gateway" to gameway's IP address and "DNS" to DNS server's IP address. Click "Apply" and restart machine. 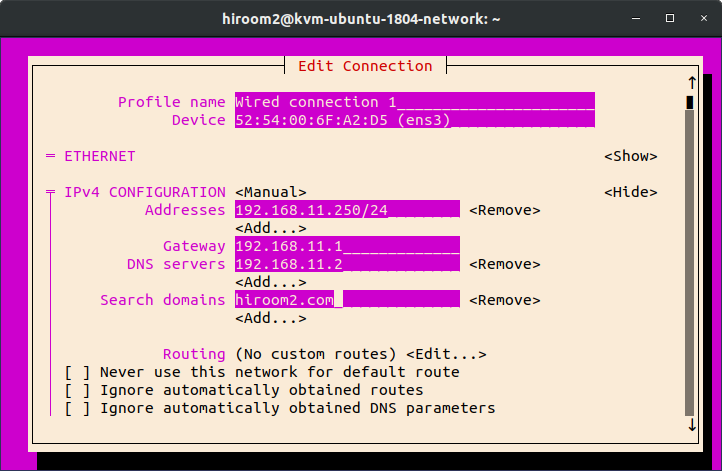 NetworkManager and systemd-resolved does not look dns-server and dns-nameservers. You need to write these to /etc/system/resolve.conf. Run nmcli command with sudo. You can move cursor with Ctrl + p, Ctrl + n and TAB, but arrow key may be easier than these. You can select item on cursor with ENTER key. 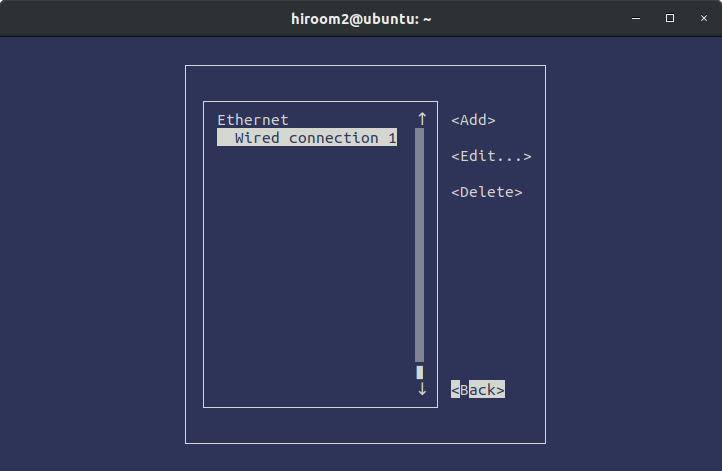 Select "Wired connection 1" of "Ethernet". 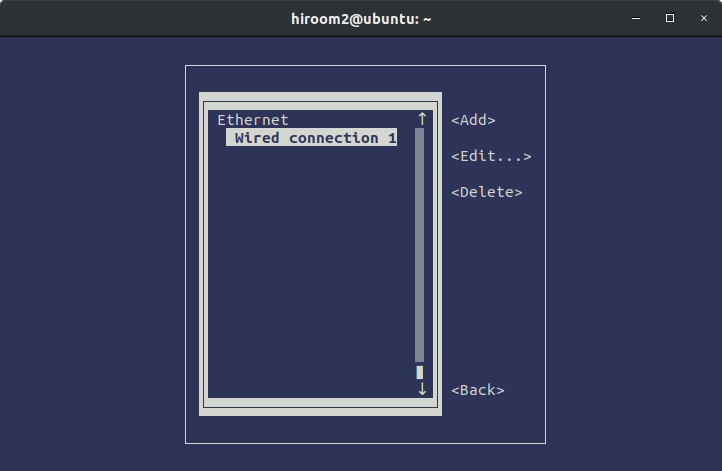 If there is no connection, you can add connection with select "Add" and "Ethernet". 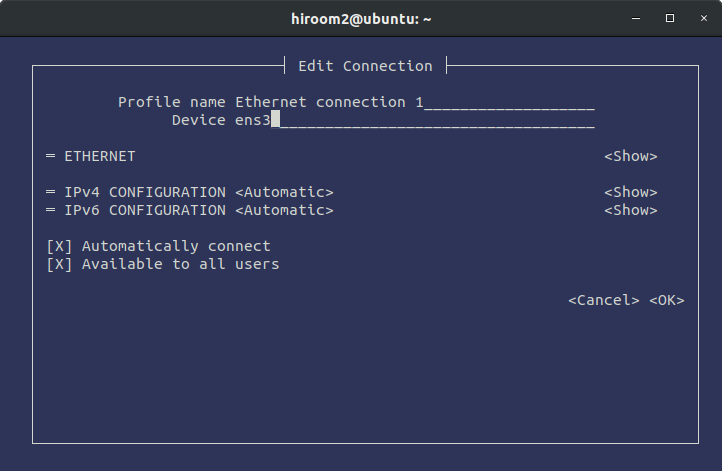 Input "Profile name" and set "Device" to your network interface name like ens3. Select right side of "IPv4 CONFIGURATION" and change it to "<Manual>". Select "<Show>" at the right side of "<Manual>". Set "Addresses" to host machine's IP address with subnet, "Gateway" to gateway's IP address, "DNS servers" to DNS server's IP address and "serch domains" to search domain in /etc/resolv.conf. Select "<OK>" at the right bottom. Select "<Back>" at the right bottom. Select "<Quit>" at the bottom. The nmcli is more useful for script than nmtui. 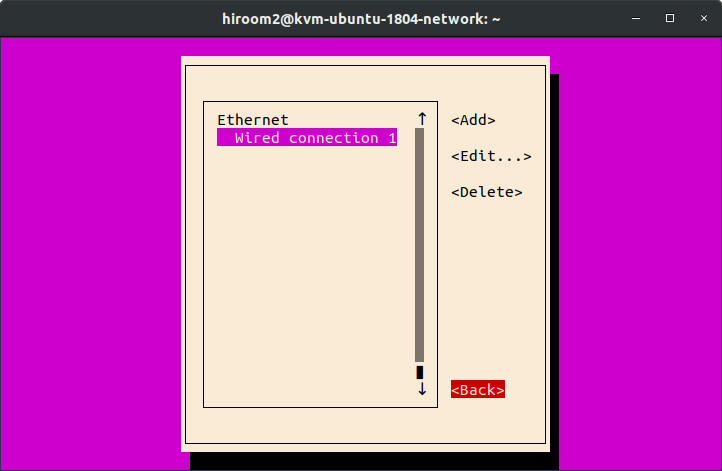 After installing Ubuntu, "Wired connection 1" is created. 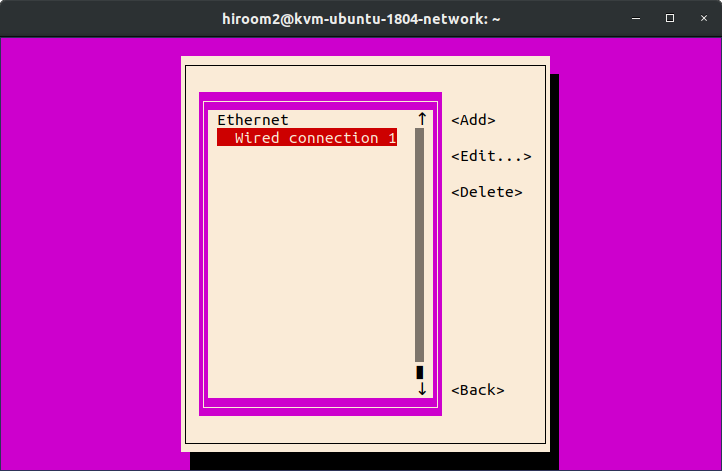 If there is no connection, you need to create a connection with "nmcli connection add". Modify connection with "nmcli connection modify". 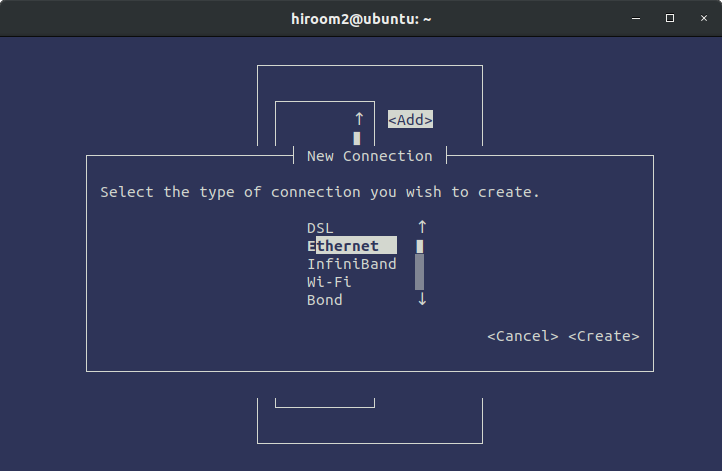 The systemd-networkd is disabled by default and this is an alternative of NetworkManager. This article will introduce about network configuration for DHCP. 3.1 Network configuration for DHCP with "Settings"
Change "IPv4 Method" to "Automatic (DHCP)". Make "DNS" to be empty. This will not apply hostname and DNS server which are provided by DHCP server. Select right side of "IPv4 CONFIGURATION" and change it to "<Automatic>". Make "Address", "Gateway", "DNS servers" and "Search domains" to be empty with selecting "<Remove>". This will change 192.168.11.2 provided by DHCP server to be 8.8.8.8. You cannot use this configuration if you use network configuration for DHCP with /etc/network/interfaces. If you append DNS server with "Networkd" of "Settings", DNS server provided by DHCP server will be used too as the following. Disable DNS server provided by DHCP server with nmcli. Now there is only specified DNS server.